I received this book from the author(s) for review. C.A Kunz have done it again! Dark Days is an extremely formidable read, one which will have you pulling the pages for more. It is irresistibly sublime! 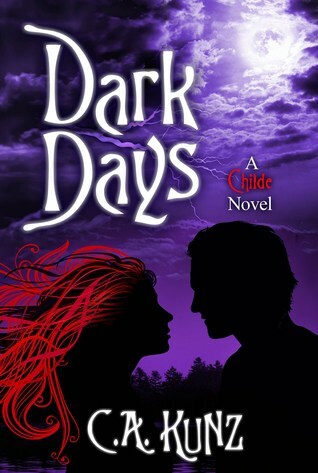 Dark Days starts of on the very same day The Childe finished so it leaves nothing out. I thoroughly enjoy reading about all te characters in the novel and that's never happened before when I read a book. Each character brings their own special quality which it just utterly fantastic. In this novel we learn more of Cats parents and get a more in-depth meaning of her friends and family. Cat it a strong, powerful standoffish kinda girl and she is definitely an inspiring character. She will forever capture my attention in just one sentence although I have the authors to thank for writing such an amazing, brilliant character. Everything about this novel pulls you in. The characters, scenes, places, people. There no faults! Literally no faults! Normally I'd wanna change something about a novel but this novel? NO! All in All: People say nothing or no ones is perfect but I disagree as C.A Kunz and their novels are just that! Perfect! Never in my life have I smiled so much when reading. C.A Kunz make everything come to life..... they venture into my imagination!! About The Authors: Carol and Adam currently reside forty-five minutes away from each other in the sunny state of Florida.